ABCDust offers state-of-the-art technologies and products that have been tested in the Chilean, Peruvian and North American Mining extreme and remote sites. ABCDust presented their solutions at Expomin 2018, at the Canada Pavilion, organized by the Minning Suppliers Trade Association (MSTA). in conjunction with Export Development Canada (EDC) and The Canadian Trade Commission Service. Expomin is the largest mining tradeshow in Latin America, with more than 70,000 visitors from across the industry. Expomin has established itself as the main meeting point that brings together new technologies, experiences, innovations, suppliers and buyers for the mining industry in Chile and Latin America. Expomin concentrates a large number of mining suppliers and the main mining companies in Chile, Peru, Argentina, Brazil, Colombia, Mexico and Bolivia that visit the fair in search of innovative solutions. “ABCDust, a leading provider in dust control and innovative soil stabilization, supplies a wide range of environmentally friendly solutions, ranging from polymers and enzymes, to mixed biodegradable asphalt emulsions, together with controlled application systems, including technologies to perform braking and friction tests, dust levels monitoring, and software’s for road management to optimize dust suppression and road maintenance programs, under extreme conditions and high quality standards”, explains Rafael Toledo, general manager of ABCDust in Chile to Revista Tecnicos Mineros. 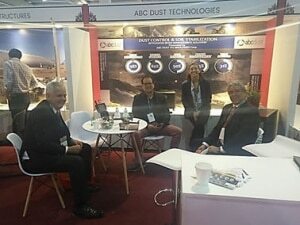 ABC Dust presented its successful experiences in its new line of DMS dust suppressors, tested and validated in Codelco Norte and Southern Copper Peru. DMS products reduce the PM10-2,5 up to 95-99%, reducing the risk of diseases such as silicosis. DMS saves 80-90% of water used in the roads and reduce braking distances by up to 82% on ramps. Another line of products, which was released were its ionic stabilizers to stabilize agricultural, municipal and mining roads, reducing the need for amendments and increase the roads lifecycle and performance. ABCDust thanks FISA for the excellent organization of EXPOMIN and MSTA, Global Affairs Canada, EDC, and the Embassy for the excellent organization of the stand and meeting schedule. For more information on how to control dust and stabilize your soil in a sustainable and efficient way, contact us.